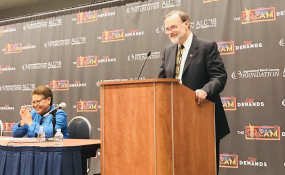 American Assistant Secretary for the Bureau of African Affairs, Tibor Nagy, is expected to visit Nigeria and five other countries on promoting stronger trade and commercial ties between the United States and Africa. According to a statement released on the U.S. state department website on Monday, Mr Nagy would visit the United Kingdom, France, Togo, Guinea, and Mali from October 29 to November 10. "During his trip, Assistant Secretary Nagy will focus on promoting stronger trade and commercial ties between the United States and Africa, harnessing the potential of Africa's youth, advancing peace and security through partnerships, and conveying the United States' unwavering commitment to Africa." According to the statement, the Mr Nagi's final stop on the trip would be in Nigeria, where he would deliver a speech at Baze University on U.S.-Africa relations. "The final stop on the trip will be Abuja, Nigeria. Assistant Secretary Nagy will have meetings with government officials, members of the American business community, religious leaders, civil society organizations, youth groups, and he will deliver a speech at Baze University on U.S.-Africa relations," the statement highlighted. Similarly, Mr Nagy would visit Lomé, Togo on November 1, Conakry, Guinea, November 2-4, and Bamako, Mali on October 4-7, where he would conduct bilateral meetings with the three government officials and meet with the countries alumni of the Young African Leaders Initiative (YALI). "Nagy will then travel to Lomé, Togo on November 1 where he will meet with Togolese government officials, and lead a regional U.S. Chiefs of Mission Conference. "In Conakry, Guinea, November 2-4, Assistant Secretary Nagy will conduct bilateral meetings with Guinea government officials, host a business roundtable, and meet with alumni of the Young African Leaders Initiative (YALI). "In Bamako, Mali on October 4-7, Assistant Secretary Nagy will hold meetings with Malian government officials, host a trade and entrepreneurship roundtable, and meet with YALI alumni.